Fiona Le is 12 years old and is seventh grade at Ernest Lawrence Middle School. 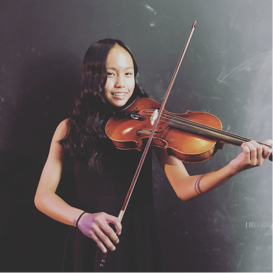 She started playing violin at age five when she joined Kadima at Van Gogh Elementary School. When she left Van Gogh the following year to attend Balboa Highly Gifted Magnet Elementary, Fiona began taking private lessons with Beth Elliott. Today, she is the Assistant Concertmaster of the Senior Philharmonic and a member of the first violin section in Kadima Conservatory Philharmonic. Additionally, Fiona is an honored member of the Master Class of Beth Elliott and Eric KM Clark. When Fiona is not playing the violin, she is usually running. As a member of the Northridge Pacers, she competes in track and field in the spring, and cross country in the fall. In addition, she likes running 5k races with her family when she isn’t doing cross country or track. Fiona also enjoys spending time with her friends and going to Magic Mountain. Fiona is very thankful for her family and friends for all their support over the years. She would also like to give special thanks to Beth Elliott, Eric KM Clark, and Kadima for always encouraging her in music and always inspiring her to reach her goals.